The December 26th issue of the Pittsburgh City Paper contains a very nice review of INDIA: NEW INSTALLATIONS, Part II, which continues through January 20, 2008. Behind the scenes (or should we say way up above?) 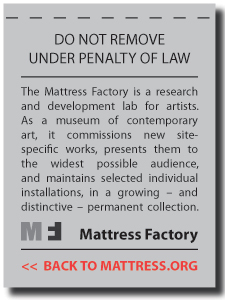 at the Mattress Factory, in the private residence of our founder and co-founder, are two fabulous personal collections containing all kinds of fun stuff. Here's your chance to take a virtual tour and see it all. On January 18, the tenth installment of the Gestures Exhibition Series will open with a reception in the satellite gallery located at 1414 Monterey Street. The event will take place from 6:00 to 8:00 PM. Heather Pesanti, Assistant Curator of Contemporary Art at Carnegie Museum of Art, will guest-curate the exhibit titled Illustrations of Catastrophe and Remote Times. In 2001, we initiated the Gestures exhibition series to present new works by regional artists. In each exhibition, participants include individuals from a wide range of creative practices. Past participants in Gestures shows have included florists, architects, graphic designers and a wig maker. The upcoming installment continues to bring together a diverse cross-section of talents and practices. Exhibiting artists include Mathew Barton and Jacob Ciocci, Black Moth Super Rainbow, John Carson, Rebecca Einhorn, Michael Ferucci, Fabrizio Gerbino, Jennifer Howison, Renee Ickes, Ben Kinsley and Jon Rubin, Ladyboy, Christiane D. Leach, Jenny Lee, Lauri Mancuso, Danny Montano, David Montano, Jairan Sadeghi, David Wettergreen, and Brett Yasko. "The participants in this show represent a wide spectrum of creative fields, techniques, media, ages, and perspectives, ranging from visual and performing artists to an experimental band and a robotics professor. Many are individuals with whom I’ve made studio visits or encountered in galleries or universities throughout the city," says Pesanti. "They are all unbelievably talented and creative, and I am looking forward to seeing the final product of their individual and collective efforts." Illustrations of Catastrophe and Remote Times opens January 18 and runs through May 11, 2008. Admission to the opening reception is FREE for members ($10.00 for the general public & $5.00 for students). Light refreshments will be served. For more information, visit www.mattress.org or call (412) 231-3169.